If you are planning to raise meat chickens on your small property, you may be wondering where the best place to raise them would be. Needless to say they should be on pasture, but how do you house and protect your pastured poultry flock? 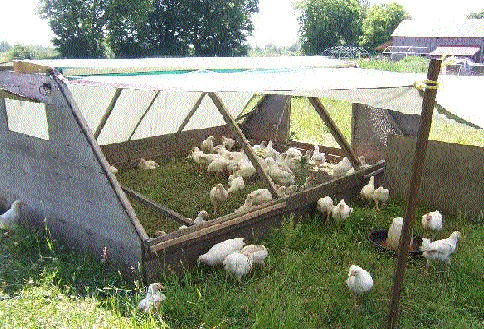 There are two main models for raising meat birds on pasture for the small farmer; day range poultry and the chicken tractor model. How do they compare? Predators. If your chickens are ranging freely, so can the 'bad guys'. Free-ranging birds are very vulnerable to predation in the daytime; losing birds this way can cost you your profit on the batch. I like to have my meat birds secure behind some sort of protection. Chickens where you don't want them. Wandering chickens can end up in your garden, and do an amazing amount of damage in a very short time. They can stroll into the woods and never return (lost, or predators, or alien abduction, perhaps?) And they tend to poop in places you would prefer they didn't. So given that, I like a system that keeps my meat birds where I want 'em, and out of places I don't. Here's a couple systems that fulfill those requirements. 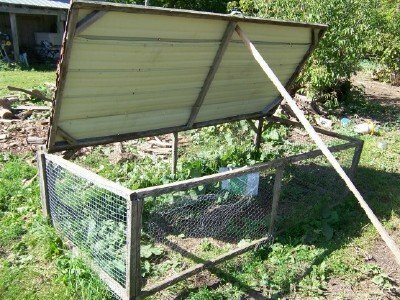 Chicken tractors are small movable pens with open bottoms that contains poultry and allows them access to the ground underneath. The pens are moved to fresh ground daily, and the chickens remain in them until they are ready for harvest. Chicken tractors have been successful on many small farms and have helped provide additional income as a great sideline business. We tried chicken tractors for a couple years at New Terra Farm, and found the results less than spectacular. We found we had to move the chicken tractors more than once a day when the birds got bigger; since they were in the pens all day and night the poop accumulated quickly. And we found it too easy to injure birds when moving the pens. There was always a fight (or flight) when we opened the pen to give the birds feed and water as well. Now some of these problems may have been due to our inexperience, but we decided to look at other models for raising meat birds. Here's the other option. Day ranging poultry means containing your birds in movable coops at night, and allowing them to range inside portable electric poultry netting in the daytime. The electric poultry netting surrounds the movable coop and both contains the birds and protects them from predators. We move the coop inside the poultry netting enclosure once or twice a week; more often as the birds get bigger. We move the whole enclosure about once every two weeks. Special note: we lock the birds out of the coop in the daytime, which helps reduce the build-up of chicken poop. Our movable coop design has a canopy attached that provides shade and shelter from inclement weather for the birds in the daytime. Having tried both models, I much prefer the day range poultry approach. The movable coop has to be moved less often than chicken tractors, because poop accumulate more slowly. The birds have access to much more fresh pasture within their pen. And, I move the coop in the daytime when the birds are outside, saving injuries. So the day range poultry model is the best approach I have found yet for the small farm flock. If you want to raise a few (or a few hundred) meat birds for your freezer or for sale, give day range poultry a try.